Welcome to day 2 of the Hero Arts Hostess Blog Hop featuring fabulous stamps from the new 2013 release. If you’ve been following along, you’ve just arrived from Nancy's blog. Remember that Hero Arts will be awarding prizes from randomly drawn comments. For a chance to win, simply comment on any of the stops along the hop on any day, including each day’s starting post at the Hero Club Blog. The more comments you leave, the better your chance of winning! My first card uses Leafy Vines, my favourite stamp from the 2013 release. There's so many possibilities with this stamp. I only used a portion of the image and stamped it in two separate corners of the card. Then I black embossed the birthday greeting from the Fancy Basics set on top of the vines. These sentiments are nice and large so they can take centre stage on a card front. I have another card using the Leafy Vines. This time I stamped the entire image. I applied several colours of Distress Inks on the stamp, sprayed it with some Perfect Pearls and stamped onto watercolour paper to achieve an ombre effect. Next up are two cards showcasing the Tall Flowers stamp. For both cards I used water colour paints to create the backgrounds, coloured the images with water colour pencils and added glittery highlights with some Stardust Pens. Thanks for visiting today! Your next stop in the hop is Cheiron's blog, can't wait to see what she's created! Oh, Sue!! These are breath-takingly beautiful!! Now I know I need those two stamps. Your coloring is magnificent!! Gorgeous cards!! So fun hopping with you!! Your leafy vines card is just so stunning. It just pops. I love that stamp and you really pushed it to the far end of GREATNESS!!! Fabulous work on all of them. Swoon! LOVE what you did with these stamps, Sue, beautifully done, Sista! Love the leafy vine card, so stunning. Thanks for the inspiration. Wow Sue, you used these stamps so beautifully on your cards! Your cards are beautiful. The leafy Vines is one of my favorites from this release. love the leafy vine stamp set. awesome job using it. Tall flower set is pretty cool too and great cards. I'm going to have to get those 2 stamps ..leafy vines and tall flowers. Just love your cards. Beautiful, Sue! I love what you did with the vines, and the tall flowers have got to go on my wish list. It keeps getting longer! :) Love hopping with you! STUNNING BGs on the TALL FLOWERS cards! LOVE the sublte color changes. Oh, my... I absolutely love what you've done with the leafy vines stamp - also my favorite! Thanks for the inspiration! Fabulous cards - I love the different styles. Absolutely LOVE how you inked up the Leafy Vines! Breath-taking, indeed, Sue! I absolutely love these Leafy Wines you used on here it´s so gorgeous and the colors are soooooo beautiful too. Stunning work here too. Awww Sue! These cards are gorgeous!!! You are so talented! Your cards are absolutely GORGEOUS! I love how you stamped the Leafy Vines stamp (my fave, too), and your cards with the Tall Flowers stamp are just beautiful! Beautiful coloring on your flower cards! Wow...."Leafy Vines" is singing to me. Lovely cards, thank you. Beautiful cards, Sue; I especially love the cards that you created with the leafy vine! Your cards using the leafy vine stamp are just fab! You have convinced me that stamp is an absolute must have! Your cards are absolutely gorgeous, love the colors and the new stamps you used!!! Oh wow! Those leafy vine cards are stunning! Love the effect you created with them, wonderful technique! Gorgeous cards! I love that leafy vine. I am getting that for sure. And the bold sentiments are fantastic! Love all the new Hero Arts stamps! Your cards are fabulous. Terrific colors you used. After seeing these the Leafy Vines stamp is on my list as is the Fancy Basics stamp. Sue, all your cards are just stunning!!! I tell ya', that Leafy Vine stamp has moved from my wish list to my "must have" list!!! Your cards turned out great! That leafy stamp is beautiful! I LOVE both birthday cards - beautiful! Love the colors. Makes me think of spring. Thank you for sharing. Great cards. Love the bling on them. Yummy, the leafy vines is definitely on my wish list! Love your ombre cards! Great coloring! All your cards are beautiful! Oh these are just beautiful cards, thanks for sharing! Oh my! These cards are amazing! I hadn't really noticed the leafy stamp but this one is a must have! I LOVE how you inked it!!! You've really sold me on that Leafy Vines stamp Sue! It's exquisite! Thanks for the inspiration! Love your leafy vines card, also my favourite from the new cataloque! Thanks for the inspiration with it! Wow they are all beautiful cards Sue and I really love how you have showcased the leafy vine stamp! Beautiful cards! Love the way you get such different effects from the same stamp! Love all the new stamps. Got to have them. beautiful...love the colors you used! Wow! You know, I would not have given the leafy vines stamp another look but you did such a beautiful job with them, they are being added to my wish list! Thanks for sharing your beautiful cards! These cards are inspiration for coloring! I've never been too good at it myself, but you've mastered the techniques! Beautiful! You've created such wonderful cards with these stamps and I think everyone will want them now, including me! Love the ambre effect on your cards. I love the ombre look I will have to get my Perfect Pearls out again and try this technique. I just love your cards what great inspiration. Great addition to the HA Blog! The distress inking of the leafy vines stamp is absolutely stunning. Wonderful cards! Love that new stamp on the first two and the watercolor bg on the others! Gorgeous cards....I am definately becoming a follower of you! Amazing cards!!! Love the leafy vines stamp and how you inked them...gorgeous! Love them! Will have to do the first technique soon. Loving that first leafy vines card... and the second one, too! Oh, and that third one... oh, I love them all! TFS such great ideas! very pretty - love your color combinations. Love the depth and shading of your stamping - gorgeous. Beautiful creations Sue. love,love,love the leafy vines, beautiful! I am so impressed! Every card is really gorgeous. All your cards are just beautiful! Thanks for sharing your talent! Beautiful cards! Looks like Leafy Vines is going to become a must have. Your cards are fabulous ! Love the colors and the stamps you used ! I love the leafy vines image! You showed some great ways to use it! Love the colors you used too! Beautiful cards! I just ordered the leafy vines stamp, so thank you for the ideas and inspiration. Love the colors on all the cards and the idea for using Perfect Pearls spray to achieve the ombre look. You have picked my favourite stamp from the new 2013 list! Great inspiration and love your cards! I love your gorgeous cards! The leafy vines backgrounds are beautiful and so is your watercoloring. What gorgeous colors on these cards. Beautiful! Love how you used the same stamp in two different ways on each card...the leafy vines are very pretty. I just got the leafy vine stamps and now I can't wait to use it because of your cards. Just gorgeous. Wow! Now I know how much I NEED that first stamp you used! Stunning! Beautiful cards and great inking on the leafy vines - love the gradiant of the colours! Beautiful cards Sue! Love the use of color! So pretty! Wonderful cards, Sue. Really like the distress ink colors you used with the leafy vines stamp on the second card. Great job!! Oh my goodness, your Leafy Vines cards are gorgeous! That stamp has just shot up to the top of my wish list! Beautiful cards. Thanks for sharing! These are just beautiful cards! Simply stunning inking Sue, beautifully done!!! love the way you used the Leafy vines stamp. So simple and beautiful. Works so men and women..perfect to have laying around waiting for a birthday to come along. Stunning cards - what a marvelous series to showcase the new set. Gorgeous! Thank you for brightening my day immeasurably. Wow Sue, your cards are fantastic! On the first two cards I love the colours and brilliant ways you used the Leafy Vines stamp! Fab backgrounds and colouring on the third and fourth cards! Oh my, oh my, these are gorgeous. I absolutely love both of those images. Your cards are fantastic. Yep, those are some TALL flowers. Thanks for sharing. Sue, the leafy vine is gorgeous - love both of those! The distress inks are perfect. Such deep, rich color Sue! Lovely designs to showcase the new Hero Arts stamps! The leafy vines are gorgeous! Awesome cards Sue! Love everything about them! Sue I love the design and coloring of all 4 cards. Clean and simple is my favorite look and you really rocked it. Thanks so much for sharing your lovely work. 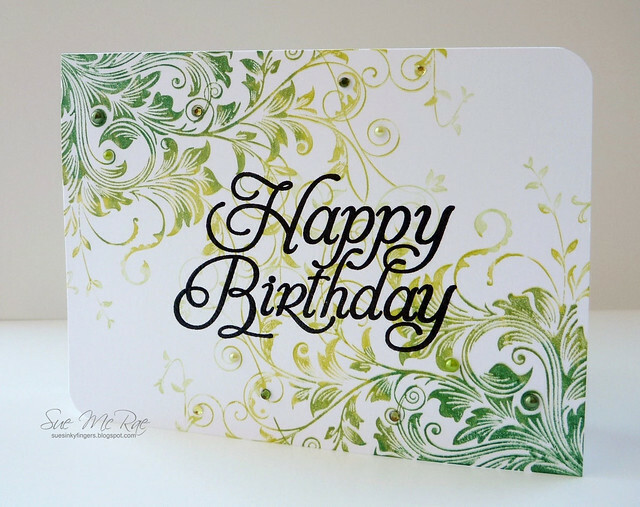 What beautiful birthday cards you made with the Leafy Vines stamp. It's another stamp I've gotta have. These cards are fantastic. I hadn't thought of these stamps as must haves. you have changed my mind. Thank you. The leafy vine stamp worked well both ways.I love the color variation. Great coloring on the tal flowers. Thanks. Very pretty cards. The first leafy vine card is stunning. Thanks so much. I just have to have leafy vine!!!! Love what you did with it! The stamp you used on the first two cards is just gorgeous and I love how you did the multi-color on it! All 4 cards are wonderful, Sue! I especially love the leafy vine cards. Beautiful cards. Love the large font and the leafy vines together. beautiful inking! I so love the vines how you used them...I think I need that stamp now! I'm absolutely wowed!!! Your first two cards are awesome!!! What an art! And you did an incredible job of coloring on those tall flowers! Gorgeous! 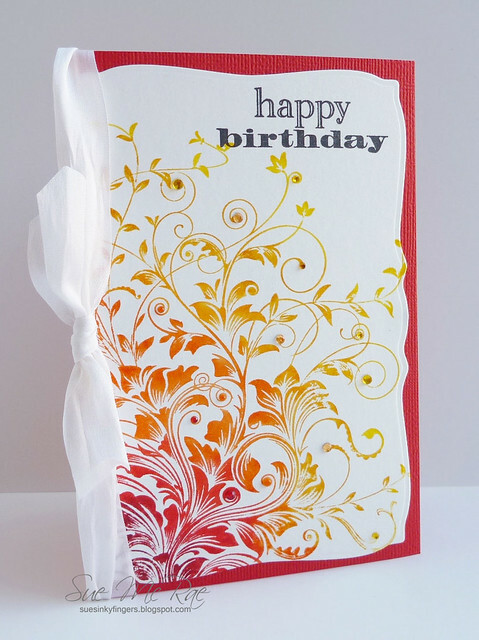 I love how you used the leafy vine and tall flowers on your cards! Truly beautiful! Thank you for sharing your talent with us on this HA hop! Some more lovely stamps I need to get. Your cards are just beautiful! val from IL. What fabulous cards -- I can't pick which I like best! The swirly leaves in hombre colors are beautiful, and so are the long-stemmed flowers. love watercolor, stardust pens, sewing and what you did with them. Oh so many cards to make and so little time. Thank you for sharing different ideas. I just love swirls and love the cards you made with the swirl stamp. Your flower cards are so pretty. Isn't neat how you can get a totally different look with just changing colors! O what a beautiful inking work. And the vines stamp I believed I needed this stamp. Sue, your cards are spectacular! I feel like I've been stalking that green leafy vines card today. It's so beautiful. Seeing those tall flowers here just bumped them up on my wish list! Thanks for sharing your cards with us! Your cards are awesome! I love how you used the leafy vines stamp. So pretty! I love the cards! When I saw you were on the hop I was excited to see what you would do as I am always stunned by your work. And oh my, these ones are gorgeous, your use of the leafy vines stamp leaves me speechless. These are just fabulous! I love your beautiful cards. Hey Sue - just love what you've done with the leafy vines and tall flowers! So many great colors and techniques here, you rock! Your cards are gorgeous! Absolutely beautiful...my favorite of the bunch is the first one. I love the background as well as the big "Happy Birthday" sentiment. SO pretty! I just love that leafy vine stamp! I love the cards you made with it. 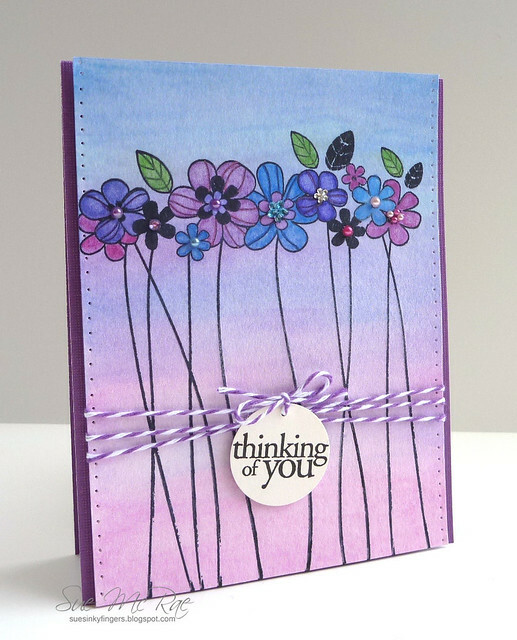 And, the tall flowers cards are so pretty, too - love the colors you've used! Oh Sue, I am in awe, these are gorgeous creations. The leafy vines stamps in the multi colors are such eye grabbers. i can't wait to get those leafy vines! I am just speechless when looking at your gorgeous cards. I just got my Leafy Vines and never thought of using only a portion of the stamp. These are beautiful, bright, and so happy. Thank You. I love that leafy vine, it is sophisticated and elegant. The leafy vine & the tall flowers are so beautiful. I like the way you stamped the vine. Thank you for your inspiration. Such vibrant colors on all your cards! Beautiful job with the new stamps! I just love your gradient theme on all your cards! That first card is such a wow with the flourish from both sides. The second a whole different look but just as beautiful! Love how the flowers look with the different hued backgrounds! Leafy Vines is also my favorite stamp from this release. Love how you used different colors on this stamp! We have similar taste in stamps as I got those two too! :> Love what you've done with them! Great cards today! The slow color change on those leaves is stunning and so happy to be a newest follower! Can't wait to see more of your work! Sue, I agree with you, that stamp is gorgeous and you really did it justice. Your watercolor cards are beautiful too!! Thanks for your inky inspiration! Love the colouring of your flowers. I like how you showed two versions of each stamp--I like the colors too. Wonderful cards!! I love that leafy vine stamp and also that nice big birthday sentiment on the first card. I loev the size of the Happy Birthday stamp and your color choices are beautiful. Wow,Sue! You used the white space with Leafy Vines so beautifully - adds to the grace of the entire design. And your rich colors on the tall flowers - brilliant! Thanks muchly. Sue, I BOW TO YOUR SUPERIOR TALENT! I'm not worthy! I'm not worthy! I'm going to faint from sheer excitement at your fabulous color and design sensibilities. Love those leafy vines ... what stunning colors. Love the leafy vines in an ombre color scheme. So delicious looking! Oh my gosh, these cards are stunning! I'm especially loving the ombre look on the first two. Wow! Beautiful cards Sue! Love how you inked those leafy vines and the inking on the tall flowers cards is gorgeous! I love the "leafy Vine" stamp, it's definitely one of my new favs. I also like how you showed off the "Tall Flowers" in two different color schemes (I think I like the purples and blues best). Thanks for sharing your beautiful cards with us and for the inspiration. All of your cards are beauties, but I think that the first one is my favorite....so simple yet elegant! Two stamps, two different cards each. Gorgeous, Sue. Thanks for sharing different ways to use these stamps. Love them all. Great cards. I love the varied colours on the leafy stamp. Oh, I do like the Leafy Vines and your inking of them -- the peak view on the Hero Arts blog of your first card caught my eye right off. Wow, your work is simply stunning, love the leafy vines! Sue, I fell in love with that very first card...one layer GORGEOUSNESS!!! Wow, you did such nice things today with the new Hero Arts stamps, I must get them all! Thanks for a great hop today! The beautifully colored flowers on top of the watercolor background are gorgeous! Very pretty such nice colors you used! Beautiful cards, and you've made the Leafy Vines stamp sing! Well done! Both colour ways of both designs are just exceptional, Sue - drooling!! Your cards are wonderful! No wonder 'leafy vines' is your favorite. It's beautiful! Thanks for sharing. YOUR CARDS ARE VERY BEAUTIFUL. I LOVE THEY VERy MUCH! WOW. You've got me pining for the Leafy Vines now. Those Tall Flowers are knock-outs! Wowzers!! These cards are gorgeous Sue!! I love how you inked up the vine stamp. And the tall flowers is now on my wish list!! So fun to be hopping with you this week! Sue I think all four of your cards are superb! I love the colours & stamps. So far I'm thinking that vines stamp is a definite must have. So gorgeous. Loved the way you colored the leafy vine. Very elegant. Love these stamps. Your cards are fantastic. The first two cards are gorgeous. gorgeous!I love that leafy vine stamp! Oh these are lovely and simple looking. Really like the vine cards. The new Hero Art's tall flower stamp is defintely on my "to buy" list. Love your treatment of the Leafy Vines stamp! Absolutely fabulous use of the ombre effect in the beautifully warm palette. Sue, Just love your cards you did for this Hero blog hop, and love looking at all your wonderful creations. Love the Leafy Vine and two beautiful cards you created with it! Your card are so elegant and marvelous!!! Great cards! Love your colors and that cool Leafy Vines stamp! I love your beautiful cards! 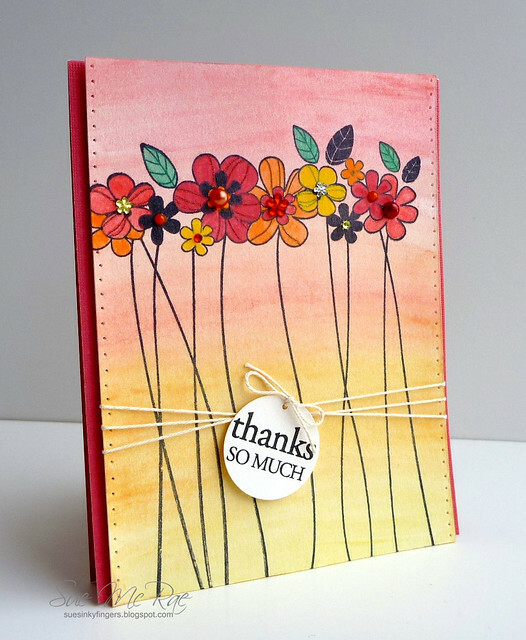 They are all amazing... beautiful use of colors and I love the leafy vines stamps (need to add it to my want list) and also the tall flowers stamps. I can see so many uses!